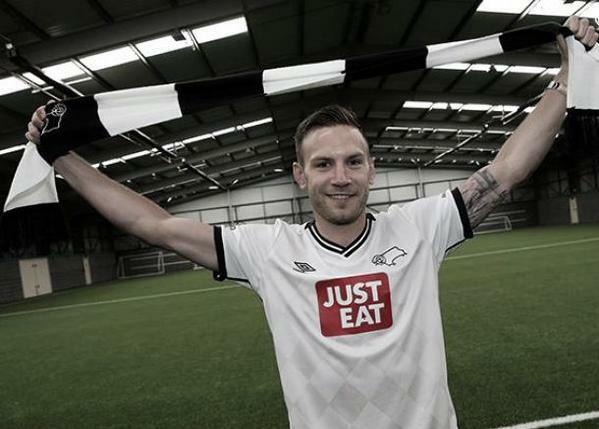 Forward Andreas Weimann has joined former Aston Villa team-mate Darren Bent at Derby after agreeing a four-year deal with the Rams. Weimann has joined Paul Clement's ambitious side for an undisclosed fee, reported to be around £2.75million. The 23-year-old has spent his entire senior career at Villa, barring two loan spells at Watford in 2011, making 129 appearances and scoring 24 times. The Austria international was a peripheral figure under Tim Sherwood in the latter part of last season and is now ready for a change of scene. "I'm excited to be here and I'm looking forward to the new challenge," he told www.dcfc.co.uk. "Derby has plans to be successful and get promoted and that's what attracted me here; I want to be part of that. "The opportunity to play first-team football and drive the team to promotion is something that I want to do. "I was at Aston Villa for eight years so I'm looking forward to this new stage in my career, although it will be a bit strange not being there. "Eight years is a long time, especially in football, so maybe a change will do me good and get me started again." Weimann is also pleased to be linking up again with Bent, who signed permanently to the iPro Stadium last week. "I know Darren from my time at Aston Villa and I think that he is a really good signing for Derby," Weimann said. "He did really well on loan here last season and, wherever he plays, he scores goals. "I am not shocked that he did so well at Derby and I am sure he will score loads of goals next season as well." Good luck Andi. I think this is where you need to be at this point in your career.